Founded in 1979 by two female cultural anthropologists, Dr. Jennifer James and Dr. Debra Boyer, Committee for Children (CFC) has maintained its dedication to producing programs that blend research and rigor with intuitive design for the past four decades. We’ve also remained an organization firmly rooted in female leadership, from most of our executive leaders to the entirety of our research team. Today, CFC’s research efforts are led by five highly accomplished female research scientists, including senior research scientist Mylien Duong, PhD, who recently co-authored a research paper on cultivating positive teacher-student relationships that was recognized by the National Association of School Psychologists as its paper of the year. Two talented research assistants complete our team. 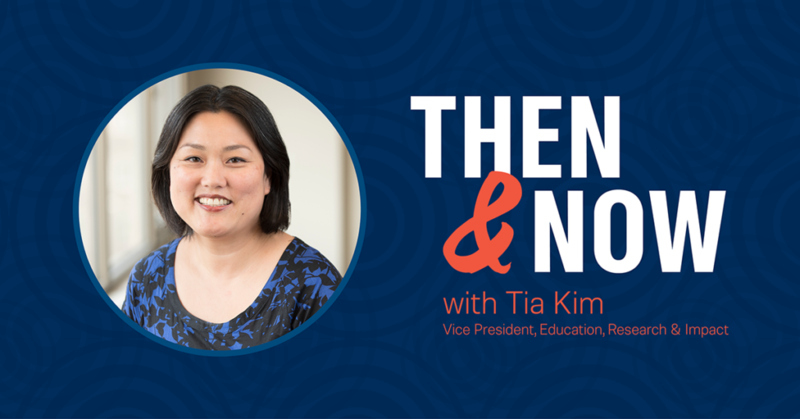 Tia Kim, CFC’s vice president of education, research, and impact, is at the helm of our team of educational designers and research scientists responsible for developing and continuously improving CFC’s programs. We sat down with Tia to talk about what drew her to the research side of psychology, the value of evidence-based social-emotional learning, and her proudest moments at CFC. I grew up in Southern California in a largely Asian community. My parents were very outwardly loving and school wasn’t the end-all, be-all. For my college application essay, I was asked to write about my personal heroine and I chose my mom—she poured so much energy into raising my sister and me and was so selfless in being a mother. But she wasn’t a “tiger mom;” all she wanted was for me to find what interested me and do it well. Most younger teenagers don’t have long-term goals (much less follow through with them), but I knew I wanted to be a psychologist and get my PhD since the age of 14. I was incredibly self-motivated when it came to school, but hung out with a group of kids who sometimes got into trouble—I was the one who came home at midnight and studied for the SAT. I found myself wondering why my friends chose to make poor decisions that I didn’t, given that we had such similar backgrounds. These thoughts evolved into research-type questions around nature vs. nurture and how early intervention might look different for different ethnic groups, and from there I decided I wanted to be a developmental psychologist. Today, I find my questions to be more nuanced. Now that we know our programs help kids, what are the underlying mechanisms that make those programs work? For which groups (determined by socioeconomic status, ethnicity, etc.) does it work, and in what context? My educational advisors, Dr. Sharon Goto (undergraduate advisor) and Dr. Nancy Guerra (graduate school advisor), were both instrumental in supporting my education. Both helped me think through short- and long-term plans for my future and could relate to the types of things I struggled with going through academia as a woman, particularly about having children. At one point I was told that it’s “never the right time to have kids—you just do it when you do it, and you figure it out,” and that’s something only women seemed to really understand. I realized that for academics, your research often stays locked away in an ivory tower. I’d always wanted my work to be applied in real settings, and CFC was a place I could take my skills from academia and see the research in action helping children and youth. I also greatly appreciated CFC’s commitment to research-based development of its programs and products while keeping them user friendly and exciting. In this field, programs and products are often either research based and not so aesthetically pleasing and user friendly, or they aren’t based in research but look great and are easy to use. We’re able to marry the two and do it really well, and we’re improving all the time. Committee for Children’s dedication to its programs being research-based and evidence-based is so important—it’s how we’ll achieve our goal of positively transforming the social-emotional well-being of 100 million kids annually by 2028. We’re a mission-oriented, continuous learning organization, and research and evaluation is how we ensure the things we’re doing are actually helping kids around the world. Although CFC has always translated research into its programs, we’re getting better at it by building a bigger, more diverse research team to support that effort. We’ve moved toward more field testing and classroom observations and have incorporated collecting more data at a faster pace to inform how we adjust our programs during development. We track the pulse of the education field and push the envelope wherever possible to innovate, whether it’s in the form of iterative development or developing the evaluation process itself. We ask—and try to answer—the really hard questions about what’s working and what isn’t so we can help move the field forward as a whole, not just our organization. I think it’s fantastic that we have an all-female research team; it’s very empowering. For those on the team who are earlier on in their career, it’s particularly valuable that they have women as mentors and role models. We all have different backgrounds, which means different perspectives. We don’t always agree, but we use a lot of social-emotional skills to hear each other out and have interesting discussions. Assertiveness is absolutely an expectation on my team. It’s actually one of my first interview questions: “Are you comfortable being direct and saying things people don’t agree with?” As a researcher, that’s part of the job. There are so many influential female researchers in the education field, both past and present. But the first that come to mind are women advancing issues concerning equity in today’s education space. One is Dr. Anne Gregory, an associate professor of psychology at Rutgers. Her research is dedicated to disparities in school discipline, and she’s been part of the Research-to-Practice Collaborative on Discipline Disparities advocating for change in the gender and race disparities within school discipline. Another is Dr. Linda Darling-Hammond, who founded the Stanford Center for Opportunity Policy in Education. She has consulted widely with federal, state, and local officials and educators on strategies for improving education policies and practices concerning equitable resources and access. And also Dr. Geneva Gay, a professor at the University of Washington. She’s internationally known for her scholarship in multicultural education and teaches multicultural education and general curriculum theory relating to curriculum design, staff development, classroom instruction, and intersections of culture, race, ethnicity, teaching, and learning. It’s much more than one moment—I’m proud of how we’ve built out our current research team (they are all so impressive) and our growing ability to encourage our product teams to making more data-informed decisions through field testing and iterative development. I think it’s very exciting to see the growth in size of the research function at CFC this past year. The entire research team is very strong and extremely bright. In particular, I’m proud of their collective contributions to all of the different program teams they work on. Translation of research is such an important part to our program development and the success of the organization, so in my view they are crucial to the organization’s overall success in making a transformative impact on the lives of children. We invite you to join us in positively transforming the social-emotional well-being of 100 million children by 2028. Become an advocate. Lend your voice. And let’s grow kinder together.